For our most precious little patients and their health care providers, Rice Lake carries several models for infant and baby weighing needs. Tray dimensions: 12" x 22" x 4-1/4"
Even the most active babies can be weighed and measured accurately, safely and quickly with the RL-DBS. The baby can be placed on the scale, quickly removed, and then have its weight recalled for charting by pressing the Recall key. 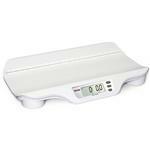 Rice Lake’s battery or AC-powered Digital Baby Scale can be placed anywhere in the facility. The RL-DBS is sleek, extremely durable, and easy to clean and maintain. Dual Range Capacity and resolution. Even the most active babies can be weighed and measured accurately, safely and quickly with the RL-DBS. The baby can be placed on the scale, quickly removed, and then have its weight recalled for charting by pressing the Recall key. 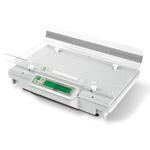 Rice Lake’s battery or AC-powered Digital Baby Scale can be placed anywhere in the facility. The RL-DBS-2 is sleek, extremely durable, and easy to clean and maintain. The Suspended Infant Scale is a portable device for the safe, accurate weighing of infants and toddlers up to 99 pounds (45kg). Designed for use in any health environment, the Suspended Infant Scale is easily transported, and powered by two AA batteries. Conveniently lift the patient using the sturdy steel S-hook attached to the optional canvas trousers. 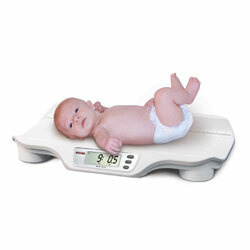 This pediatric scale is versatile in its applications, and the innovative weighing technique captures vital information safely and accurately.